Geekvape Karma Kit Review - Daily Vaping Deals & The Best Vape Product Reviews at Vaping Cheap! Mechanical mods may not be as popular as they used to be, but there are still many vapers who still prefer to vape using a mechanical mod over any other vaping device. Mechanical mods are definitely a preference, and may not be for everyone, but still has its place in the vaping world. Mechanical mods just vape much differently in comparison to any regulated mod, and this is only one of the reasons as to why a vaper would choose a mechanical mod. 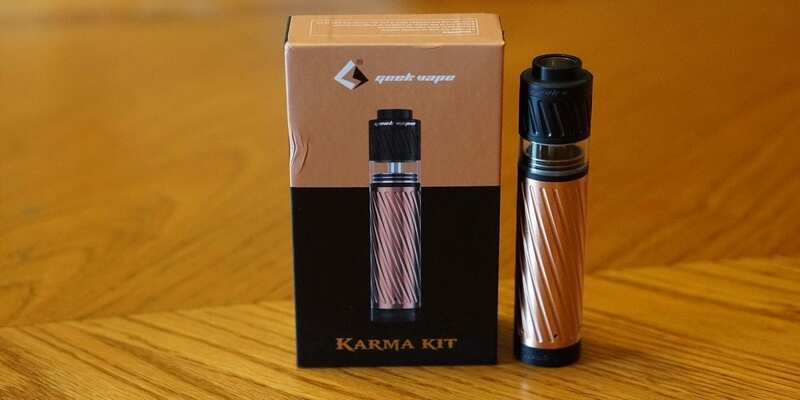 Geekvape has finally stepped into the world of mechanical devices, and have released their brand new Karma Kit. This is an entire kit that includes both a mechanical tube mod and an atomizer! Firstly, I would like to thank Heaven Gifts for sending me this kit for the purposes of this review. I will give you my overall impressions, tell you what I like and do not like, and conclude by telling you whether or not I recommend purchasing this kit! Check Out the Geekvape Karma Kit Here! Use Coupon Code AHG299 to receive a discount! Click Here to Check Out the Geekvape Karma Kit! Upon first receiving the Geekvape Karma Kit, the first thing I immediately noticed was the excellent packaging. Honestly, for the price of this kit, you would not expect such nice packaging. In the front of the packaging, you see the kit itself pictured, and on the back there is information about what is included in the packaging. In addition, on the top of the box it comes in there are warnings, which is definitely welcomed. The box easily slides open and reveals the Karma Kit. Included with this kit, you do receive the mechanical mod, the Karma atomizer, an extra glass tank section, a ton of extras and a user manual. The first thing I noticed once I opened the box is the spiral type of design on the mechanical mod. It certainly is eye appealing, and I personally like it. However, I can see people not liking it as much as I do. When I first held the mod itself, I was surprised, because of how it felt. 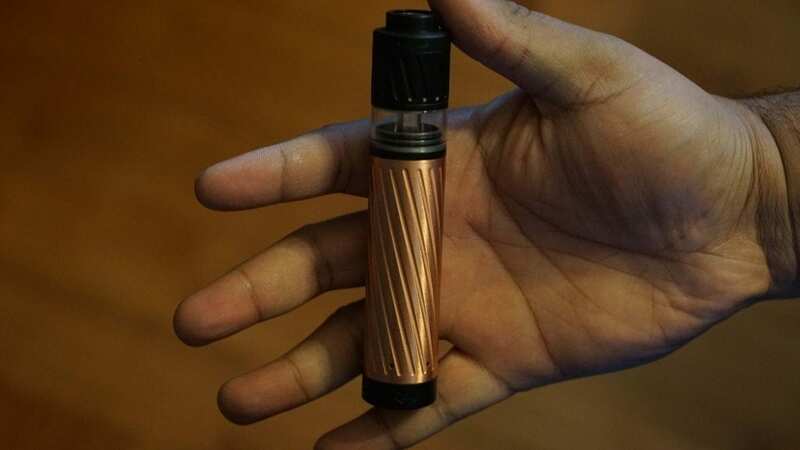 This mod is copper, so I was expecting a copper feel, but when I held first held it, it certainly did not feel like a normal copper tube mod. Honestly, it feels like there is some type of coating on the metal. Also, I didn’t notice a copper smell either, which was quite surprising as well. Now, I do want to mention that this mod is a hybrid mechanical mod, This means that your battery and atomizer 510 pin will make direct contact. It is extremely important, and I cannot stress this enough, that you use an atomizer with a protruding 510 pin. You do not want to use a sub ohm tank or anything that does not have a protruding 510 pin, or you will hard short your battery. This is something you want to avoid at all costs. Also, make sure you use good batteries, and always stay within the battery limits. Right away, I will state that this kit is not for beginners. On the top of the mechanical tube mod, it does say “Black Ring”, so I would assume the mod itself is named Black Ring. The mechanical mod was pretty comfortable to hold, and the button was nice and smooth. There isn’t much pressure needed to push the fire button either, which is a pro in my opinion. In addition, there are vent holes along the bottom of the device. Also, the Geekvape logo is on the fire button, which was a nice touch. You can sit this device on a flat surface without it firing which is another huge pro. Inside of the tube mod is what looks to be a delrin sleeve, which is to provide protection if your battery has a tear. Once again, it is important to use proper batteries when vaping with this device, and make sure there are no tears regardless if there is any type of protection. It is better to play it safe than sorry. The threads on the mod were also pretty smooth as well, and the overall quality was solid. Honestly, Geekvape has been releasing some top notch products lately, and this kit is yet another example. Onto the Karma atomizer, which is an RDTA and RDA. The quality of this atomizer was also top notch, and it kind of reminded me of the IJoy Limitless RDTA due to its design. Even though this is the case, it still had some differences which make it unique. For one, you do not need to purchase any additions to transform it into an RDA, which is definitely a huge pro. In addition, this atomizer features a wide bore drip cap, and it does include a 510 drip tip so you can use your own preferred 510 drip tips. This is again, another huge pro. I do want to mention that the top cap was extremely difficult to take off at first. I would assume with some e-liquid, the top cap will loosen up a bit. In addition, the Karma atomizer does have 3 airflow holes on each side, which can all be adjusted. Also, it does support single coil builds since you can completely shut one side off. This atomizer features a 2 post velocity styled build deck, and can be wicked just like most RDTAs on the market. In addition, it does feature a protruding 510 pin, which means this atomizer is safe to use on the Black Ring mechanical tube mod. Something else I want to mention is that this atomizer is extremely easy to convert into an RDA. Literally, all you have to do is unscrew the build deck, and then unscrew the middle section which is what the deck was originally attached to. Once you do this, take off the glass tank section, and attach the build deck section back into the base of the atomizer. It really is that simple. All the threads on the Karma RDTA were extremely smooth as well. I do want to mention that there is a small o-ring under the build deck, and under the other 510 connection for when using this atomizer in RDTA mode, be sure to not lose this o-ring. All in all, my first impressions of the Geekvape Karma were all positive! The quality of this kit was great, and the fact that you can use the Karma atomizer as either an RDA or RDTA was a huge pro! In the next section, I will go over building and wicking the Karma atomizer! As stated previously, the Karma Atomizer features a 2 post velocity styled build deck. This build deck is similar to what you would find in many Geekvape atomizers, so if you’re familiar with those, this isn’t any different, which is definitely a good thing! With this build deck, you can easily fit Fused Clapton coils with no issues. However, some thicker coil builds may prove to be an issue, but I do think they would fit with relative ease. Just like with any velocity styled build deck, it is extremely easy to center your builds. Honestly, like said in many of my other reviews, this is probably the easiest build deck to work on, and I still think so up to this day. I could easily throw a build in this atomizer in less than 5 minutes and have it ready to be wicked. The screws are also really good, and I have not stripped any. Wicking the Karma atomizer is easy in both RDA and RDTA mode. In RDTA mode, you wick it exactly the same as the IJoy Limitless RDTA or IJoy Combo RDTA. I place my wicks into the channel, and cut them right where the glass tank section is, so that it sits right on top. I found this to be the optimal way of wicking this atomizer. In addition, when wicking it in RDA mode, it is extremely easy as well. Since the deck section has cut outs, you can just place your cotton into this area, and it’ll wick just fine. Overall, building and wicking this atomizer in both RDTA and RDA mode is extremely easy! With the velocity styled build deck, it just makes installing coils effortless. In the next section, I will go over the performance of both the Karma atomizer and the Black Ring mechanical mod! The overall performance of the Black Ring was excellent, especially considering the price! I do want to mention once more that you should only be using atomizers with protruding 510 pins. As you would expect with a hybrid mechanical tube mod, it does hit pretty well. Honestly, I was surprised by how good the vape quality was of this device. I really wasn’t expecting a lot, due to its price, but it does hit rather well. Even though it does vape well, it’s certainly not the “hardest hitting” mechanical tube mod I own. However, you cannot expect it to hit as hard as a mechanical tube mod that’s 3 or 4 times its price. Regardless, it does still perform pretty well in comparison. The button is also really nice and smooth as well. The throw is not short, but it still has a decent travel distance. This is preference, so if you prefer an extremely short throw, then you might find this to be a con. I do not find this as a con, as I do not prefer an extremely short throw. I do want to mention that this mod does utilize magnets rather than springs, so this is once again preference, so if you’re a vaper who prefers springs you may not like the button. Also, like stated in the first impressions, you do not need a ton of pressure to make connection, which is definitely a pro in my opinion. What is a con though is that there is battery rattle. The battery rattle is not terrible by any means, but it is still there, so it has to be mentioned. It did not bother me too much, but I still prefer no battery rattle. A pro to this device is that it is pretty comfortable to hold! The size, to me, is perfect. It is not too long nor is it too short. Also, I did not really get a copper smell on my hand when using this device, which was definitely a pro in my opinion. I personally dislike the smell of copper, so I was glad the smell did not really get onto my hands while using it. I do want to mention that you do feel the spiral design when holding it, this may be something that someone might not like. I personally did not mind it, and honestly it really gave the mod a good look. The overall diameter of this mod is 25mm, so your 24mm and 22mm won’t look the best on it, but honestly I like the way 24mm atomizers look when attached to it. The Karma atomizer is 25mm so it’ll look flush, which is great, but this may be seen as a con to some vapers. All of my atomizers with protruding 510 pins made a connection and fired with no issues, so that’s another pro to this device. Overall, the performance of the Black Ring mechanical mod was solid, especially for the price of this kit. The mod was comfortable to hold, and the button was smooth. The overall performance of the Geekvape Karma Atomizer was excellent! Regardless of which mode this atomizer was in, either RDA or RDTA, the performance was stellar. The overall diameter of this atomizer is 25mm, so it’ll sit on the Black Ring mechanical mod perfectly. My favorite coil build for this atomizer in either RDA mode or RDTA mode was a dual fused Clapton which had a resistance of 0.17 ohm. If you are building at these lower resistances, be sure to understand battery safety and ohms law, especially when vaping on a mechanical mod. With this specific build, I got a very satisfying vape experience. 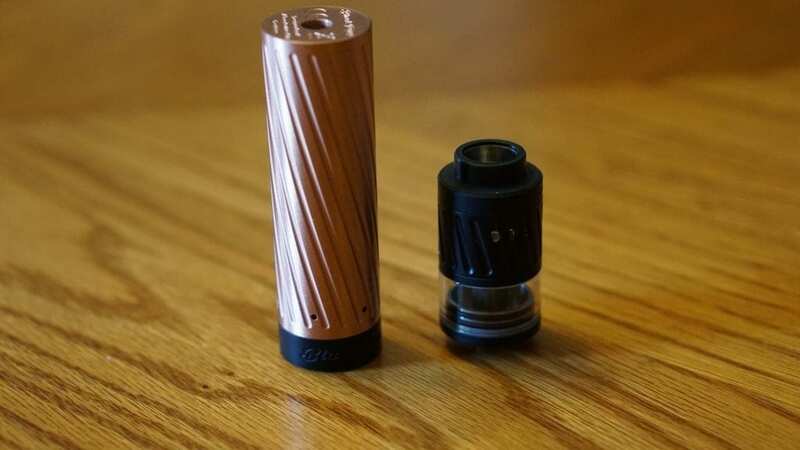 It is important to note that mechanical mods do perform better at lower resistances, since the output wattage is determined by the resistance of your coil build; hence is why it is important to understand ohms law. I do want to mention that regardless of which mode this atomizer is in, make sure everything is on tightly. This would be especially important in RDA mode. When using this atomizer in RDA mode, it is possible that the deck can start to unscrew or loosen, so make sure it is tightly in place and will not move during use. The last thing you want to happen is the deck section loosening and the battery making contact with the threads by the 510 pin. With that being said, I much preferred to use this atomizer as an RDTA rather than an RDA. In either configuration, the vape experience was similar, so having the extra e-liquid capacity underneath in RDTA mode was convenient. However, the vape experience was still excellent in RDA mode. With the airflow wide open, it was just too much for me personally. The airflow is nice and smooth, and very airy. For me, the perfect amount of airflow was with 2 airflow holes open. This gave the perfect amount of restriction for the way I like to vape. In addition, the flavor was better like this comparison to wide open airflow. I do think if the top cap was a bit shorter, it would certainly help the flavor. The flavor is good, but I do think it could be a bit better. With just 1 airflow hole open on each side, it does increase the flavor even more, but it was just too restrictive for me. The wide bore drip cap is quite large as well, and I personally prefer wider bore drip tips, so it was not a con for me. However, some may not like that the drip cap is as wide as it is, but they do include a 510 drip tip adapter, so that helps with this issue. In RDTA mode, once you wick it as I stated previously, it has no issues keeping up. Also, filling the RDTA is extremely easy, and is very similar to the IJoy Limitless RDTA. In RDA mode, I could easily get 10 drags before needing to drip again while vaping the same fused Clapton build. What is nice though, is that you can just drip right through the wide bore cap, so no need to take off the top cap! I do want to mention that the o-ring tolerance on the top cap is very tight. Even with e-liquid lubricating it, it still was relatively stiff. I think the o-rings would be a bit better, and I do find this as a con. There were times where I use quite a bit of strength to either take off the top cap completely, or to adjust the airflow. All in all, the Karma Atomizer performed quite well overall! I did prefer to vape this atomizer as an RDTA, simply because of the tank reservoir, but either way it vaped really well. This atomizer offers tons of airflow, and is simple to build and wick. Even though these are all pros, there are still some cons to this kit, which leads me to the next section, the cons! The first con to be mentioned is the battery rattle. The battery rattle is not terrible by any means, but still exist; therefore it must be mentioned as a con. The second con to be mentioned is the tolerances of the o-rings for the top cap of the Karma Atomizer. The tolerances are just too tight, and it takes too much effort to adjust the airflow or even take off the top cap. Even when it is lubricated with e-liquid, the tolerances were still too tight. The next con to be mentioned is subjective, which is that the diameter of the mechanical mod is 25mm. This means that all your atomizers under 24mm will not sit flush and may look awkward. Personally, I think 24mm atomizers look fine, but 22mm atomizers do not look great. It is understandable that the diameter is 25mm since the Karma Atomizer is the same. 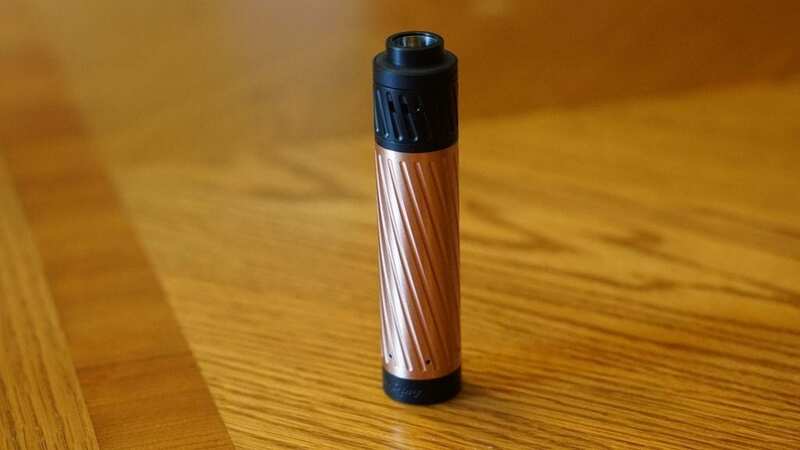 Another con to be mentioned is that this mechanical mod is copper. 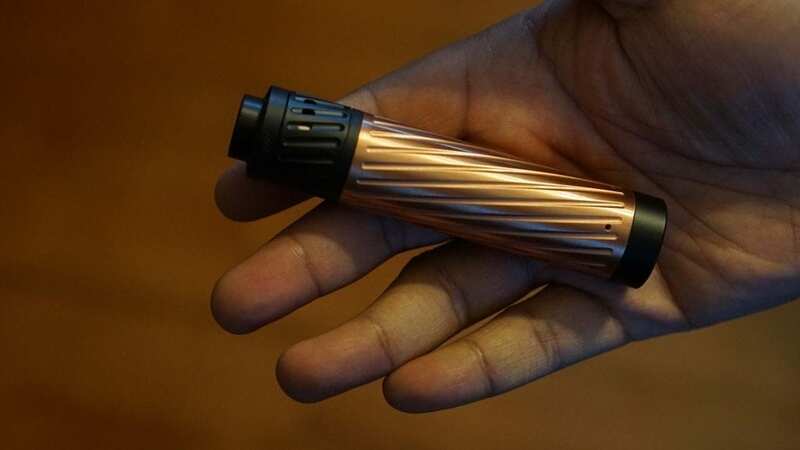 Even though I do not really get the copper smell on my hands, some vapers just dislike copper, so this is certainly subjective. A subjective con is the throw. It is a slightly longer throw in my opinion, but I’m perfectly satisfied with it. Some vapers prefer shorter throws over longer throws, so this is definitely worth mentioning. In addition, a subjective con is the size of the wide bore drip tip. None of the drip tips I personally own fit including Goon and Kennedy drip tips. They do include a 510 drip tip adapter, but still this is worth mentioning. Even though there are some cons to this kit, it still offers a ton of value for the money, which leads me to the next section, the conclusion! In conclusion, the Geekvape Karma Kit is a great introduction to the vaper looking to get into mechanical mods. Typically, mechanical mods are much more expensive, so I’m happy Geekvape has released their own kit that is affordable. Since there are no safety features with this kit, it is extremely important to understand battery safety, ohms law, and what a hybrid mechanical device is before purchasing something like this. I really cannot stress this enough. Now, for the experience vapers who wants to get into mechanical mods, this is a perfect kit for you. This kit offers both an atomizer and a mechanical mod. The Black Ring performs great, and best of all, there is hardly any copper smell on my hand after using it! In addition, the Karma performs just as well as most other RDTAs on the market. Not to mention, this atomizer can be used as an RDA or an RDTA, which is a huge pro! There are some small issues with both devices such as minor battery rattle and the tolerance of the top cap o-ring, but honestly they’re cons that can easily be overlooked. All in all, I can easily recommend the Geekvape Karma Kit to the experienced vaper who wants to add another mechanical mod to their collection, or who wants to get into mechanical mods. Just make sure you understand safety first as mentioned previously. I do not recommend this kit to the beginner, as this is simply not for you. So if you’re looking for an affordable mechanical mod kit, then the Geekvape Karma Kit is definitely something to check out! If you are interested in purchasing this kit, we do have a coupon code, which is “AHG299” which will bring the total cost of this entire kit to only $29.90! This coupon code does expire on 12/20/16. I hope this review has helped you pick the right device for you! Feel free to leave any comments or questions down below! Thanks for reading! Allegedly the final retail version is going to have the battery rattle fixed.